So, like many of you, I went this weekend to see the film The Fault in Our Stars, based on the book of the same name by John Green. The plot: teenagers Hazel and Gus meet, fall in love, and go on an adventure. The meet at a support group for teens who have cancer. That both complicates and deepens their relationship. I am one of the handful of people who have not read the book. I didn't get it for review, and when it became so popular, I decided it didn't need me -- not the way that other books may. And, of course -- I don't like books about dying kids. No matter how it's dressed up or done, they're not for me. Oh, as a teen I went through a phase that included titles like A Summer to Die and Beat the Turtle Drum , but now? As an adult? Books like The Fault in Our Stars are the type of book where I read the end first, so I know who lives and dies. And it's the type of film where I look for the spoilers so I know, beforehand, what happens. My fourteen year old niece wanted to see The Fault in Our Stars, not because she's read the book, but because so many in her eighth grade have read it and planned on seeing it. So, off we went! For the record: I cried. She didn't. It's a good movie, with a good cast. I can't speak as to how well it was adapted, having not read the source material. I can say that the film made perfect sense to me. I also feel like my seeing the film opening weekend was a political statement: much as I love watching superhero films, Hollywood needs to be shown, with bodies and money, that other films will bring in money and should be getting made. Gus and Hazel's friendship and romance is touching and lovely. They share a passion for a book, and travel to Amsterdam to ask the reclusive author about the ending. It's the type of trip that makes one want to go Amsterdam, and stay where they stay, and to go with someone you love. Yes, this is love story about two teens. I wouldn't call the movie itself a "romance" because under my definition of that term, at the end of the movie the couple is together. Had this movie ended five minutes before it did, my definition would have been met. But, it ends with Gus's cancer returning, and Gus dying. Of course, I cried. I cried not so much for Gus or Hazel, but because I am reminded of other deaths and other funerals, and other losses. And I picture those real-life people. I cried for the loss of the parents who shouldn't have to bury a son. I cry because I'm being manipulated to cry, but I know and accept that, because that's what fiction does. Hazel and Gus are smart and funny, and their love, I think, is more than a "typical" teen romance because of the knowledge that, at least for Hazel, who is terminal, this will in all likelihood be her only romance. Teens in love may frequently believe that to be true, but for Hazel and Gus it is true. The characters that interested me the most, though, were not Hazel and Gus who, for all their smart wordplay are still teens (Gus, in particular, I thought, was a bit too smug and puppy dog) (The plane scene? I'm sorry. Just, no. Was that real or fake?). Instead, the people who intrigued me were adults: the reclusive author, Peter Van Houten, and Hazel's parents. Van Houten, a cranky, mean drunk, was my favorite character, followed by Hazel's parents who have half-reconciled themselves to the death of their only child. (Half reconciled, because who is wholey reconciled?) Van Houten I loved because he didn't treat the two teens any differently than he'd treat any adult, and isn't that what teens say they want? And he didn't pity Hazel or Gus and didn't change just because two kids with cancer were in the room. I liked him all the more when I realized, at the end, that he was not so much the author who doesn't want to interact with readers -- which, let me tell you, is reason enough because I don't think an author owes their readers anything, not handshake, photo, autograph, or visit -- but that Van Houten represents Hazel's worst fears. Van Houten is her nightmare about what will happen to her parents after her death: that they will be broken by it and unable to go forward. The death of a child may indeed do that to parents, and The Fault in Our Stars ups that manipulation factor (what will happen to them?) by making Hazel an only child. As much as Hazel says she worries about her parents and what will happen when she is gone, as much as she looks for answers in literature (Van Houten's book is about the death of a child with cancer and Hazel wants to know "what happens next" to the fictitious child's loved ones), when confronted with the reality -- Van Houten's book was about his dead daughter -- she runs. And when she finally confronts her parents about her worst fear, about what will happen to them once she's gone, they reassure her. Are they telling her the truth, or lies to ease her worry? The truth is, there are more people who go on after the death of loved ones than those who are destroyed by it. And Hazel is aware of that, on some level -- she is the one who stands up in group to say, well, everyone dies eventually and we are all eventually forgotten. What she doesn't say or realize is that death is not new, even if with our first loss it seems something never felt or experienced by any one else. And something that shatters in such a way that there is no tomorrow. But there is, and Hazel learns that for herself, when Gus dies: experiencing a loss she never thought she would, experiencing what she imagines her loved ones will. Of course, this is an adult watching this film. But that's OK: different people experience things like books and TV and film differently. 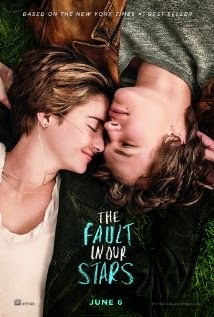 What I like about the film, The Fault in Our Stars, is that it does work for both teens and adult viewing it. The teens in the back row of the theater probably hated the author and swooned over Gus. So, what about you? Am I the lone person who likes Van Houten? Do I not give Gus enough credit? My 12-year-old has been noodging me so haaard to read the book, and I REALLY don't want to. (It reminds me of when my dad was trying to make me read Kurt Vonnegut. YOU ARE NOT THE BOSS OF ME!) I'm with you on needing to know the spoilers; I knew about that character's fate. And oh god, as a parent, WHY would I want to put myself through a literary or cinematic experience that's my deepest real-life fear? (And for me to swoon over that Elgort kid would just be pervy.) Everything I've read makes me want to see the movie less, not more. So I'm gonna see if I can assuage her by offering to read Looking for Alaska. I also liked Van Houten. In addition to it being a story about kids with cancer, love, life, and all that--it's also a story about a relationship with a book. I went Friday night to see the movie with other librarians and teens from my library system, and it was quite an experience seeing this movie with a large audience of mostly teenagers. I thought it was a really good adaptation of the book (which I listened to on audio), but while I found myself reacting to it like a grownup (identifying with the parents who are facing the loss of a child, thinking about the deaths of others I've known), the teens really made it an interactive viewing experience. Lots of vocal reaction (particularly when Gus shows up, winks at Hazel, takes his shirt off) and loud sobs through the last third of the movie. As an adult, I also found myself identifying much more strongly with the adults in the film, especially Hazel's parents. This was also true when I read the book. I love what you said about going to the film on the opening weekend being a political act. It was for me, too. This is a good, fair review, Liz. Marjorie, yes on the pervy comment. I can remember sighing with relief once Heath Ledger turned 21. I so adored him in ROAR and 10 THINGS. Ramona, reading more about that book, and their relationship, makes me interested in reading the book. Just, no rush. Kathleen, it was funny-- the young people in my theatre cried and laughed a few moments before any sad/funny moment happened. And I'm not sure they appreciated what I thought was funny. Clementine, thank you. I hope we get more faithful and good film adaptations. I haven't been able to face going to see this in theaters. I am sure I would cry and cry. From the perspective of the book, though, I can say that I very much enjoyed the subplot about the author, and how unfriendly he is to Hazel and Grace when they visit. Would it be too awful to do like I do for Moulin Rouge? Watch the movie, but stop before the sad ending happens?